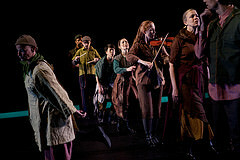 This past weekend Meredith Monk and Vocal Ensemble brought Monk’s performative piece “On Behalf of Nature” to the Yerba Buena Theater. With five singers and four superlative musicians, who seemed to be able to change instruments as easily as most people change socks, Monk explored the question of the impact of sound and image with a rigorous and inventive compositional style. Before the piece opens the audience is faced with a stark stage, a cluster of instruments stage right indicates where the band will be, and silvery hoops of about six inches in diameter hang suspended from the borders above. These are withdrawn into the fly space above the stage when the piece begins. The stage lights darken completely and only the sound of a flute playing a simple five-note phrase floats into our consciousness. The phrase repeats and then skips upward a sixth. What follows then is a series of short episodic pieces that are minimalist in both vocal and visual presence. Two vocalists gesture with their hands, a series of sharp barks, the clustered singers wave, recede into the stage’s shadows. There is a duet of movements, some like dance, some like tai chi. Was that a glissade? Gestures repeat and become hypnotic. There is muttering and rolling across the floor. The musicians join the singer/dancers, then flow back to their instrument-stocked space. At one point a series of black-and-white images was projected as a movie at the back of the stage. The images included sun flares, fish, a couple kissing, plants blooming, men drinking, a rocket launch, a chameleon’s eye, Klan members, cows fording a stream, a fly, a man washing his hands with sand, a child breastfeeding, soldiers, and ocean waves falling over and over. Although the collage seems random, it’s clear it is carefully crafted. And that could be said of all the elements of the performance. Each episode of the performers’ gestures and sounds is suggestive, and nothing is explained: we are after all in a realm of abstract sound, decorated by the world of physical movement. What all of this allows is for our pattern-making minds to interpret as it sees fit. We can hardly do anything else, and this is the power of Monk’s work: that it stimulates the observer’s imagination so that they become an active participant in the project. Afterwards, I was able to talk briefly with Monk in the YBCA green room, and she confirmed that the score had been carefully crafted before the musicians and performers entered rehearsal. Although it is one of the music’s virtue that it seems to have evolved in some magically collaborative way. The movement part of the piece, however, was developed in rehearsal. Because the work was titled “On Behalf of Nature” I asked if she felt that the piece and the performers acted as a conduit between nature and the audience. She seemed to agree with that interpretation, but replied that the idea had come from Gary Snyder’s essay, “Writers and the War Against Nature.” Snyder is from the poetic school that believes in the shamanic role of the poet, and it is this word – shamanic – that Monk used in conversation to describe her relationship to nature. Nature as she conceived it was a combination of many “realms.” She also stated that one of her concerns was to make music primary, that the visual aspects of performance often overshadowed music turning sound into a background effect. Holding music in the foreground was one of her goals.